A fearkiller: not as fear-ish or killer-ish as it sounds. Now that you’ve read the above definition, forget it. Forget you ever saw it. The words after it, too. Back to reality. October, 2014. We just heard this “fearkiller” word. Let’s think about this word. Cue dramatic music. That guy who does all the trailers that need his moody, throaty voice starts to speak. We cast some white guy, handsome-ish. Stockyish. Nope. Just got a call from the Finance guys. Need the actress to be white, too. Can’t you just see that story? I wish I lived in a world where the first definition would be the one that naturally came to everyone’s mind instead of the second movie idea. The average person in this world would hear the word “fearkiller” and think of, say a doctor or a teacher. Basically, a world where fear doesn’t live in the collective headspace like it does right now. That’s my driver for writing the Fearkiller series. The word itself is about taking negatives and turning them into a positive—not a super-charged negative. Fearkiller (Volume 1) is, partially, about a guy who begins the story in the frame of mind that would embrace the second fearkiller idea, then he learns that the first concept is more accurate. Unfortunately, he committed the unforgivable sin as the first step towards learning this fact. Which was a good character for helping arrive at the positive meaning. He gets to tell the reader everything from the point of view of a true outsider. All of us are inside the circle, he isn’t any longer. He can look in a window and see all of us from points of view we can’t see. Since I put the book out, people have asked me why this guy had to be a killer and the reason is that I needed an outsider to look back at that decade and its unique strain of fear. As I was writing the first draft of Volume 1 back in April–May 2010, the Tea Party was in its infancy. The ugly energy that swept the GOP to win big in 2010 was ramping up. (They won that election by deploying an insidious, racist, sexist, awful strain of fear.) This was back when Donald Trump still had plenty of listeners when he questioned our president’s birth certificate. Plus, our defense mechanisms to fight all of this weren’t as built up as they are now. This was back when we all still went to bed shocked about the events of the day. On top of all of the ugly energy from the world stage, we were stressed about jobs and earning money. That energy brought out all sorts of ugliness from people back then. When I began Fearkiller (Volume 1), all I had was a word that wasn’t the word it appeared to be on the surface. I wanted to dig for the meaning. And here we are, I just put the sequel out. 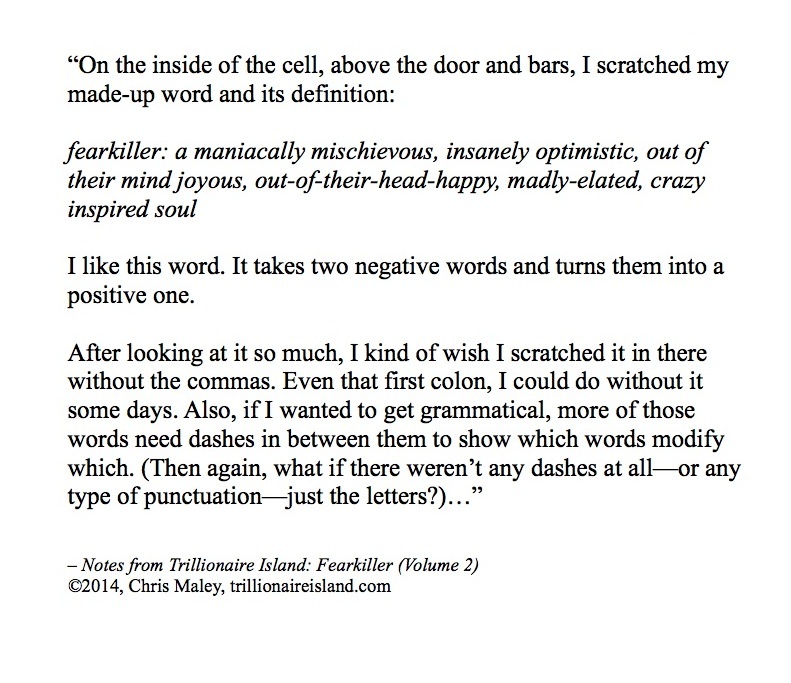 I want to say more and blog more about both Fearkiller (Volume 1) and Notes from Trillionaire Island: Fearkiller (Volume 2) in the next few weeks. **2018 update: The Fearkiller Two Volume Set is now available. Get both books in one Kindle. I am donating $.50 from each purchase to Rock the Vote. But thanks for listening to this post. I’ve been wanting to say this thought about the word fearkiller for a while. The world has enough negative words. This word “fearkiller” isn’t one of them.